Whether you’re the owner of a business, a representative or member of staff in a company, or just the “Average Joe” typing an email to send to a client, business college or friend, it’s usually a good idea to have some sort of an email signature set up for when you’re sending emails. So shortly we’re going to look at setting up an email signature in Gmail. Well you’re in luck – those of you who use Google’s Gmail service in particular! I’ve come across a number of tutorials when it comes to setting up an email signature in Gmail, but I’ve always felt that they were a little too “over-engineered” than they needed to be. 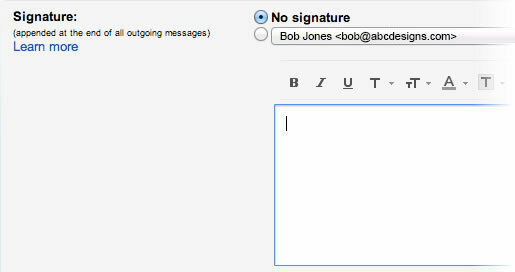 So the following tutorial is a quick, straight-to-the-point way of setting up your Gmail email signature. Below is a screenshot of an example Gmail email signature that you could have! In this tutorial, we’re going to keep this simple and create a basic text-based email signature in Gmail, but by all means, feel free to explore the other features that Google provides you with in its email signature options. Also, please keep in mind, these steps are assuming that you have a Gmail account already, so let’s get started! Launch your preferred Internet Browser (mine is Google Chrome). 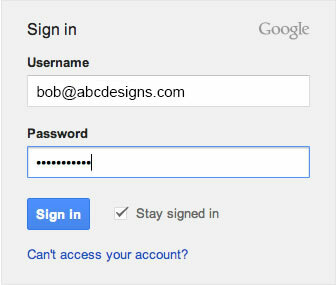 Go to www.gmail.com and login to your Gmail account. 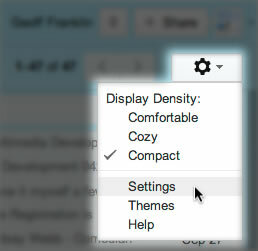 Once logged in, find and click on Settings (which should be the “cog” drop down menu towards the top-right of the page). Then click Settings in the drop down menu. The Settings page should load and you should be on the General tab. Scroll down till you find the Signature section. By default, the No signature radio button will be selected, so you’ll need to click on the radio button below it and select your Gmail email (from the drop down list, if applicable). Using the tools above the text field, you can format the look and feel of the text to suit your business’s branding or to something more appealing to you. When you’re done, scroll to the bottom of the screen and click the Save Changes button. 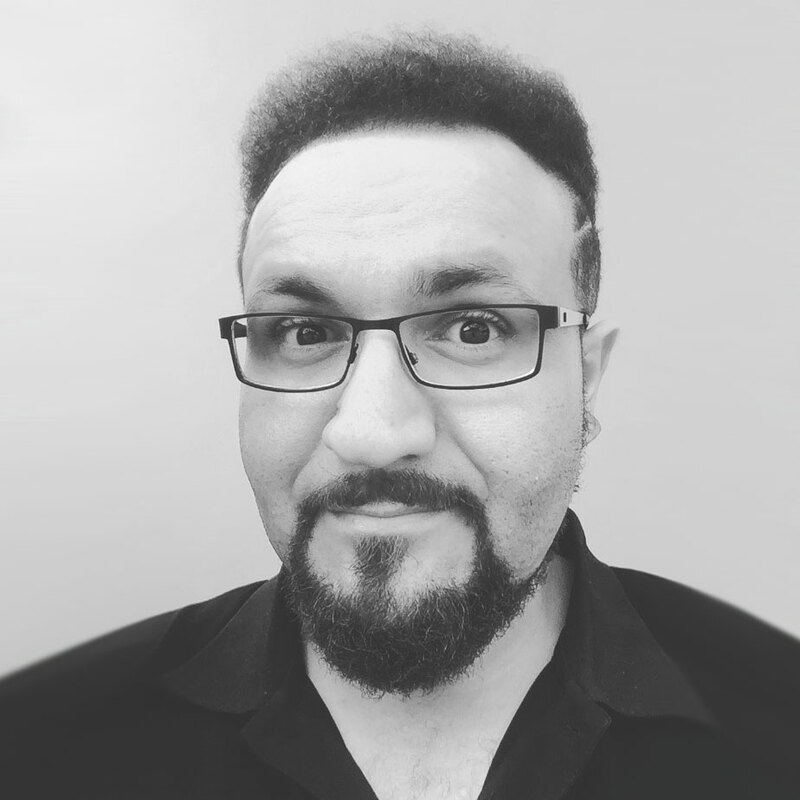 You may find that your new email signature isn’t appearing (or appearing properly) where you want it to in your emails – which is usually just below where you’re about to type your message. Click on the “cog” Settings drop down menu and select Settings. Then click on the Labs tab. Scroll down until you find Signature tweaks and click on the Enable radio button. Then scroll to the bottom of the page and click the Save Changes button. 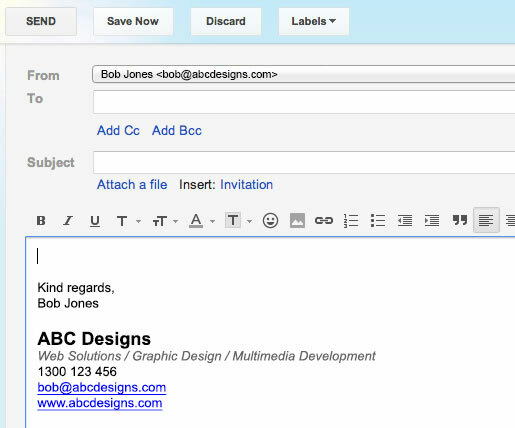 Step 9 – You’re done making your email signature in Gmail! That’s it! You’re now ready to enjoy your new Gmail email signature. So now when you click on Compose to write a new email, or when you click on Reply or Forward for another email, you should now see your new Gmail email signature entered into the text area. Hi Lindy, glad you found this article useful and got your email signature working in your Gmail account. When you refer to “I have gmail automatically on my laptop”, are you referring to Apple Mail or another app on your MacBook Air? If you’re referring to Apple Mail, it won’t pull in the email signature you create within Gmail, so you’d need to create and setup a new email signature for your Gmail account within Apple Mail.